Champion du Lys, grey Selle Francais Stallion by (Laeken / Karen du Lys [Largny]), born in 1990, standing approximately 16.2 hands. Champion du Lys is regarded as one of the best show jumping sires worldwide. His lifetime winnings amount to almost € 2 Mio. Ridden by Ludger Beerbaum his career highlights include winning the 2003 “Hamburger Derby” and numerous classes at Grand Prix and Nation Cup level. His offspring follow in his footsteps: The licensed stallion Cabellero was the most expensive PSI-auction horse in 2006 and the following year he was proclaimed the superior winner of the world championships of young show jumpers in Lanaken. The eight year old Cockney has won with Philipp Weishaupt and Ludger Beerbaum eight classes ranging from 1.50m up to CSI***. The licensed Champion F.P. won in 2005 and 2006 the qualifier in Warendorf with scores of up to 9.0 and continued his career at the 1.50 level. Crossing Jordan won with Alois Pollman-Schweckhorst in Falsterbo. More than 87,000 Euros have been earned by Champion du Luys’ progeny in the jumping circuit. 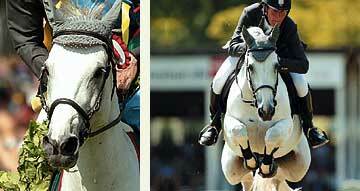 Champion du Lys has valuable French sport genes – his grandsire Mexico is full brother to the great stallion Furioso II, who has produced innumerable jumping and dressage horses as well as flourishing stallion lines. We are certain; after an outstanding athletic career all doors are open for Champion du Lys to continue his breeding career.